One of the advantages of being a docent in uniform is that visitors share information with you in the field. 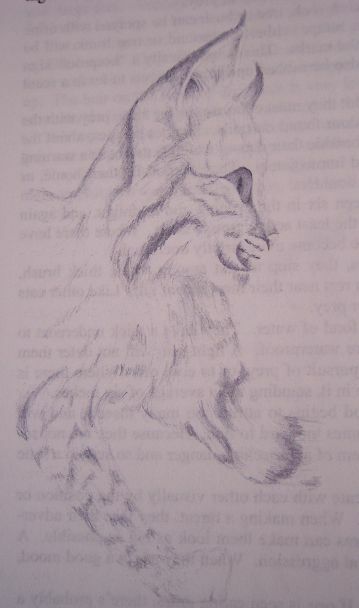 One such interesting experience happened to Kay Madore and me on 2 February 2005, that vividly illustrates why so often 20 pound bobcats are mistaken as mountain lions. We talked to a visitor at Monument Hill, who relayed growing up on the wild west edge of Murrieta, and seeing bobcats and mountain lions at his house and nearby. As I always do in such cases, I asked him if he was sure about the mountain lion sightings, since 80% of all mountain lion sightings are something else. He assured me he did, and I was confident he was correct, since he had seen both. 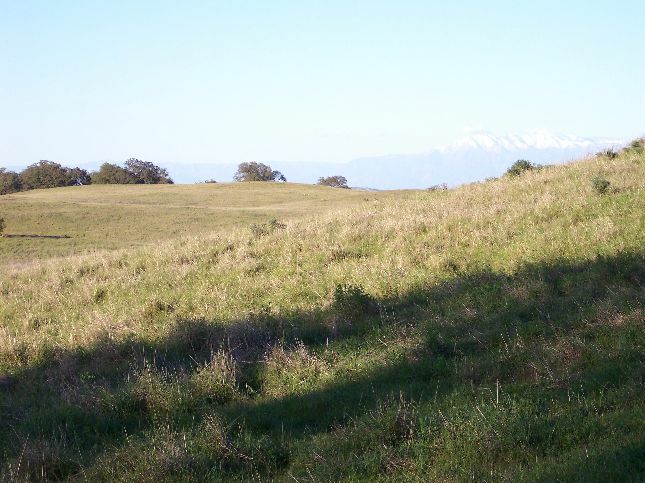 Later in the day, heading south on the Trans Preserve Trail, passing Poppy Hill, he excitedly came back to us and reported he had just seen a bobcat on the south side of Hidden Valley Road, and a mountain lion on the north side. We got very excited about this as well, since Kay had just seen a mountain lion on Poppy Hill a month earlier in the same location. We hurried to where he had last seen them, feeling quite safe in our total group of four people. 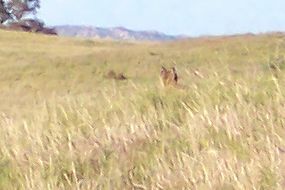 The bobcat on the left couldn't be seen, but there on the right, in the distance, was - a bobcat! The visitor quickly realized his "mountain lion" was in fact a bobcat. 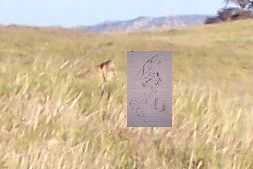 Here are pictures of that bobcat, showing how difficult it is to identify an animal at the typical distances it is seen. 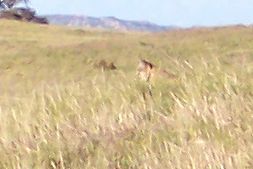 The pictures were taken with a 5 Mpixel camera, with a 3x zoom lens, fully zoomed in on the mountain lion. Can you find the bobcat in the picture above? Hint: it is just above the center of the picture. 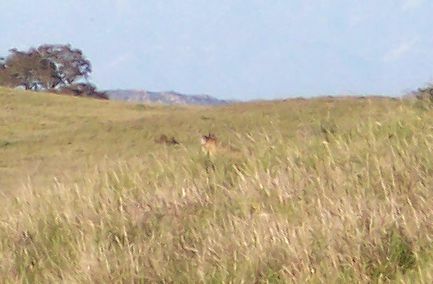 Here are blowups of the three pictures in which the bobcat could be seen. These blowups approximate what the human eye saw in the field. The first picture below is from the picture above. What really surprised me was that the bobcat looks very funny in the first picture above. It looked to me like the face of Samuel Johnson, or some equally dour 17th Century figure, pasted onto the body of a bobcat! Drawings from Rick Bramhall reproduced by permission. Rick's images are copyrighted, and cannot be reproduced further without permission.